I would like to discuss the name of Hugelitod in Dohrman Prophecy. To me, this name is one of most enigmatic code in this novel. And one day, I found the similar name with Hugelitod in internet. This name seems female name. Is Hugelitod the masculine form of Hugelita? If there are German members in this forum, I would like to hear your opinion. And I want to know what image the name of Hugelitod has in German culture and its Genetic Mind. just my own take on the name ... nothing "official" - just my best guess - thanks for your interesting topic. Hugeltod may be a "clue" to why the WMs chose this moment in time to release their findings to humanity ... James refered to this Time as - when we are at the Apex of Knowledge ... everything is down hill from here, unless we make the leap - and fly ! Hmmm, you disassemble this name into parts. Yes, Hugel is popular sound vibration even to Japanese Genetic Mind. And Hugel means “hill” in German language. As you put it, the image of hill would have some symbols in the backstory of WingMakers, like Lea. This in my opinion, but the final letter “d” would be mute character, if the origin of this name is French. This name means the Big Light? This image might have relationship with the Kings Star. This term might be coined terms by a German, Karl von Reichenbach. yes, thank you for pointing that out, it seems that I am still using the "scientific method" of investigation ... breaking it down into pieces that I can "recognize" - instead of addressing its "wholeness" ... and I must admit, that I didn't "like" the name, the first time I saw it, because it was difficult for me to pronounce, and I didn't feel comfortable or confident, with the way I was pronouncing ... was that a programed reaction that "tainted" my opinion of this character (perhaps) - german = superiority complex priest = superiority complex (in my mind) and while I am examining how I "think" - I must also admit that when he accepted the invitation to speak with UBERlords (on their terms) - I considered that "self-victimization" - especially when he agreed to stand in the bliss-light - and was aware of how it was altering his perspective ... but who's to say, that if I had not been in his position (had his experiences) that I would not have done the same thing ??? thank you, I appreciate what this topic has inspired me to understand about myself ... my maiden name, was Burke, and I always disliked that the Encyclopedia (and Dictionaries) at the time when I was young and looking it up - associated that name with Irish grave robbers ... and that it rhymed with 'jerk' I happily changed it to Brooks, when I married, and kept that name even after my divorce - it made me feel closer to Nature - my nature, since I have always been a "babbler"
Yes, this name is very odd name to everyone , I believe. Because, as you said, no one knows how to pronounce this name. And yes, my real question is whether this name is actual name or James' creation. I guess, the name of Hugelitod is not actual name. And I assume this name is synthetic name from German and French. And like these French names, final “d” is mute character. en passant, these names are family name. So I believe the sound vibration of Hugelitod is huge-lit. And next question is why this name is made from two different languages. Fascinating reading what you have posted. When I first encountered this word I got it to four syllables, and that way of pronouncing has been stuck ever since... it's hu-ge-li-tod for me. No one who thinks/pronounces in the language of english would be able to pronounce this word in those four syllables the way I pronounce it (the Finnish tongue)... this name really doesn't mean anything to me. Maybe it is not a real name but a nickname? ...I thought that Hugelitod was connected to the Chinese tongue (because it was so alien to me), never would I have thought about German or French. What about the name Karnomen? What do ye folk know about that name? Yes, Karnomen is also odd name to me. If this name also has some relationship with French, the sound vibration would be converted to Carnot-men. Carnot seems very famous elite lineage in France. Some French People could feel noble lineage as the first Initiate of Karnomen in the depth of their Genetic Mind. But, this is my instant typing, sorry. haha. and Cogniti - the visionary that threatened the mighty Anu (sounds Italian) - a vital "cog" in the clockworks? You led me to this point of view, thank you. As the tribute to you, I would like to share some episodes with you. I published the Lyricus Discourses in Japan 2012. 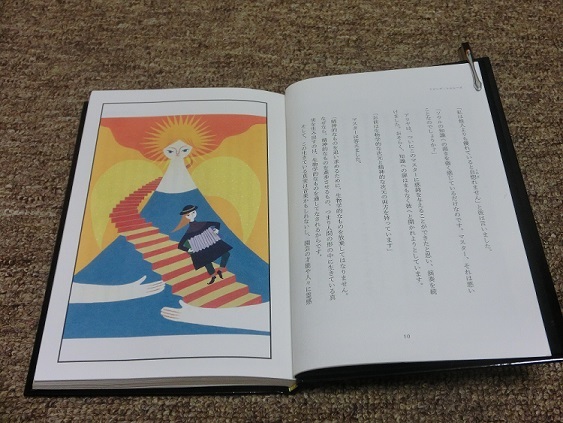 I expressed various attempts to expand the understanding of readers in this book. 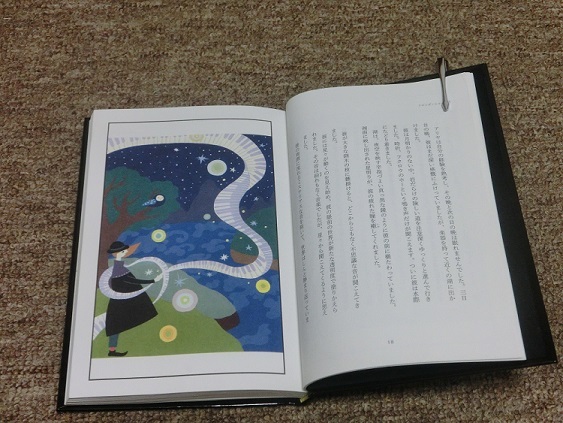 For example, I assembled the special book version of shima’s note on WingMakers Philosophy. And the biggest feature of this book was the Living Truth. I love the Living Truth, and I determined to contain this story in the book of Lyricus Discourses. I wanted to insert the illustration in the Living Truth. I asked a talented artist to draw them. 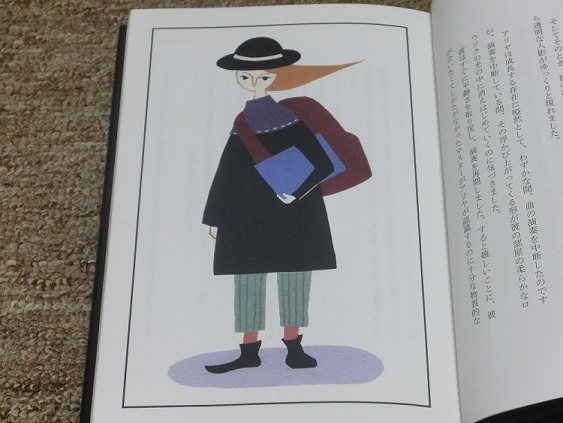 The artist name is Mai Ohno. She is the daughter of Yuriko Ohno who was co-translator / teacher of translation of my first three WingMakers Books. Her works were wonderful, but I was surprised by one thing. She expressed the musical instrument as the organ, wind box. I imaged the string instruments. It has no reason ,but I imaged so. I wondered the differences between us. I asked why? And Denali said she imaged just so in her mind. Then I researched about the organ, and I found this musical instrument has strong relationship with German. Because the origin of name of Alija seems also German to me in the private research of mine. This name is foud in Bosnia , Hercegovina today. Do you know the origin of Alija?? Maybe the fact that James was raised in Spain, has something to do with his choice of names for characters ... but I got the distinct impression that James didn't write the Living Truth - it is a "story" that the LTO members repeat - that he shared with us ... like we share "fairy-tales" - it teaches the value of perseverance IMO, because he didn't get any results until he created something unique and then played his original composition, seven times in a row (practice, practice practice)... I assumed, his name is a common name in their "world" ? I have always associated it with the music of Chamber 10 (Anthem of the Sovereign Integral (state of consciousness)) because when it was released, it was suggested that we listen to it seven times in a row - uninterrupted - which would result in the listener being able to experience a vibration, that reassured them, that they were - in tune with the Tone of Equality - it creates its own "frequency field" that allows us to "see" into the spiritual realms - quite clearly when we cross into that "stream". Alija - That's a good one! I was not aware of this, until you brought it up. Heh, just when I thought I could not find anything new on the WM website, I encounter this forum discussion about Alija. The Lyricus Teaching Order uses storytelling to convey its teachings more than books, discourses or lectures. Stories are very powerful tools in the spiritual works since they have facets of interpretation and creative flex that makes them wonderful tools to interact within a group. In the case of the Lyricus stories, they are holographic as well, being able to be understood simul- taneously on many levels. This story is transcribed by James. I just read it... And I was about to ask for it first (the living truth.pdf) where to find it ? But while I thought about that - I searched the WM website for it and while the internet was "buffering" (loading), I searched my computer for it and to my surprise I already had it downloaded... lazy me, always downloading stuff and not reading instantly after download. Thank you Shima for this topic as it inspired stardusters replies which inspired your replies, which inspired me on many levels. Thank you! ...at the subject of seven, musically speaking; the Chamber 7 composition from the First Source CD, has the same "anthemious" melody as Chamber 10 - I have always associated the Chamber 7 and Chamber 10 melody - there is difference thou, but it stems from the same root. As does all WM music, but CH 7 and CH 10 are v. closely related melodically. Here I made a short MP3 sample -Chamber 10 and 7 mixed. Thank you for commenting and correcting my simple mistake. Yes, this instrument is the accordion. My mind missed the word tomorrow by mysterious reason. The modern-day-style of accordion was invention of German. And yes, Denali also imaged clavier (keyboard instrument) ,and she selected the accordion by reading my translation. These arts are also NEW to me! The original pdf file did not have these art works. I would like to introduce Denali’s version of Alija. Some call it a squeeze box or plicate. Plicate Squeeze the Breather Box ! In Icelandic they call it harmónikku which is nice! And for the sake of randomness बाजा that's what its called in Nepal the land of natures fine plants and mountains! Having fun with google translate. Back to topic, shima I liked those pictures and Denali's version of Alija had some likeness to that Chamber 24 style human body/head ... the picture with the claviature and the nature/sky is cool! I am very glad to see survivors in this forum. You can see them in this file. The artist name is Ishdeep. Last edited by starduster on Thu Jan 22, 2015 12:57 pm, edited 1 time in total. Yes, Many Students of WMM feel some associations between Chamber 10 and the Living Truth. And it is the amazing finding that you sense the sound of accordion in Chamber 10. The accordion would be proper instrument for Alija. I really appreciate to recognize this by us collectively. Yes, the imagination is inspired by artwork. 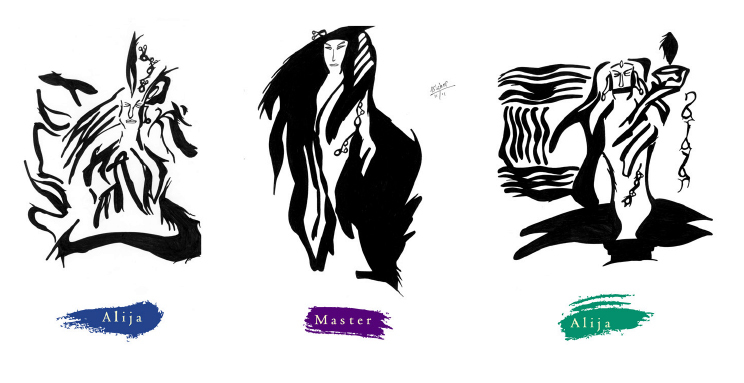 So I have assembled various artworks. More sample of shima’s Note. Hi Shima, glad to see you are still curious. I appreciate you popping in and introducing yet another interesting inquiry! I received the opinion about this topic from Dr.Lock. as an aside, Terran was a name I did recognized, having been stuck there for several weeks once, which makes me think that I should look up the history of that city, since I have actual experiences to give me a better "vision" of it than any of the other names of characters he has introduced to us ... I could easily visualize the street and roof-top homes he so skillfully describes ... even talking about it now brings up smells and sounds from my memories... I can almost taste the dry dusty air scented lightly with incense. Reading between the lines I see this grouping as sounds of power said in a mantra that opens doors in your head beyond this one.